A standard clean up crew featuring Dwarf Ceriths, Florida Ceriths, Nerites, and Nassarius snails. Ships Free! 20 Dwarf Ceriths - small cleaners that get to the nooks and crannies. Feed on diatoms, cyano, algal detritus, and film algae. Nocturnal cleaners that leave the sandbed at night to search for food. 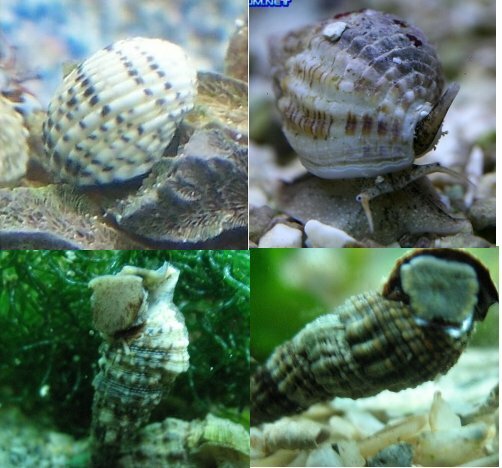 7 Nassarius vibex - scavenger snails that will eat leftover food and some fish waste. They will stir sand, but can also be kept in bare bottom tanks. 6 Florida Ceriths - small cleaners that get to the nooks and crannies. Feed on fine hair algae, diatoms, cyano, algal detritus, and film algae. Nocturnal cleaners that leave the sandbed at night to search for food. 10 Nerites - We are currently offering the longer lived and quite hardy Antillean Nerite. (Nerita fulgurans). It grows to a nice size,and consumes a good deal of diatoms, cyano, algal detritus, and film algae. It will also consume some fine hair algae. A nocturnal herbivore that will feed more often at night, they tend to need some time to adjust to the limitations of the aquarium during their first week. Choose the Free Priority Mail Quick Crew shipping option at checkout. You can add any items to this order WITHOUT a star* next to their name and they would ship for free as well. For example, the Rock Boring Urchin* cannot be shipped with 2 day Mail.